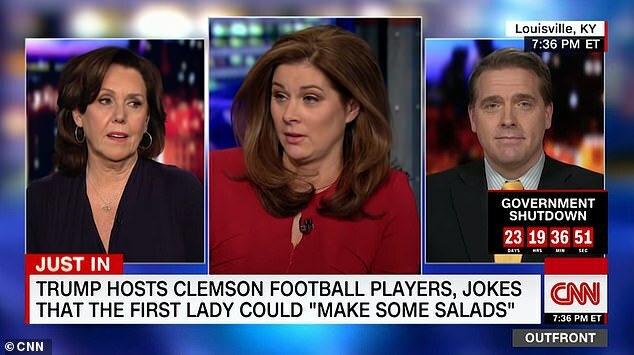 Was President Donald Trump being sexist by saying that he thought about asking his wife, First Lady Melania Trump, and Vice President Mike Pence’s wife, Karen Pence, to prepare salads for the Clemson football team? 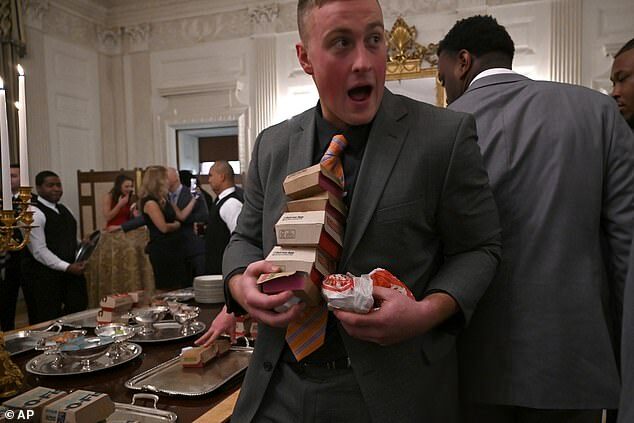 The President on Monday said he nearly fed hungry Clemson football players salads prepared by the First and Second Ladies but decided to purchase them fast food, instead, for a White House event celebrating their national title. The Clemson Tigers were invited to the White House after winning the 2018 national championship. Trump’s comment angered Twitter users as well as commentators on cable news giant CNN. 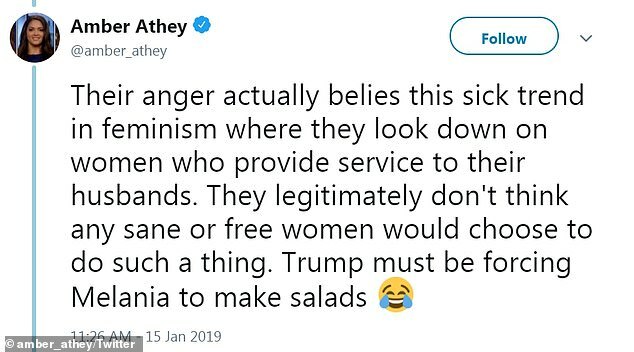 ‘Yes, by all means, have the women make the salads. WTF dude,’ wrote on Twitter user. ‘Just had to throw in some misogyny,’ tweeted another Twitter user. ‘Bwhahahahhaha like [Melania Trump] has ever been in a kitchen preparing food EVER since she became a Trump,’ another Twitter user wrote. ‘Can we have a gif of Melania with her red garden gloves on making salad,’ tweeted another Twitter user. Erin Burnett, who hosts a nightly talk show on CNN, and one of her guests, journalist and liberal commentator Joan Walsh, both blasted Trump on Tuesday. ‘It seems to me like the president will not be happy until there is not one single female Republican voter in the country,’ Walsh told Burnett on her program on Tuesday. ‘He shouldn’t talk about the First Lady in that way. We aren’t all here to make salads for men. Burnett agreed, saying: ‘This is one of those things where sometimes what people say when they’re being funny exposes exactly who they are and what they think. Burnett invited a conservative panelist, Scott Jennings, disagreed with Burnett and Walsh. ‘I certainly didn’t take his comments to be sexist,’ he said. ‘I think that if somebody took them that way, you know, that’s fine. Burnett pushed back on Jennings’ take, asking him: ‘How in the world can you not perceive that as sexist, to make the assumption that his wife will go make salads for a bunch of football players? Jennings replied: ‘I didn’t hear it that way…. I make salad, and my wife makes salad…. It didn’t strike me that way. One Twitter user wrote: ‘Wow. Trump just told [the Clemson football team’ he could have had the first lady make salads for the men, and Scott Jennings said on it wasn’t sexist because men eat salads. 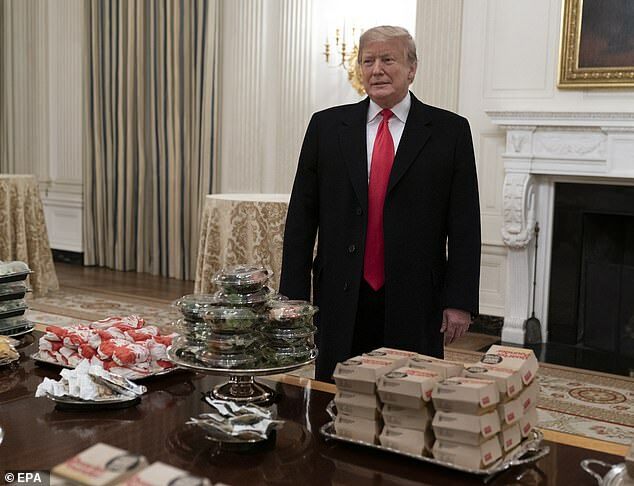 The President said in remarks to the Clemson football team on Monday that he had ‘1,000 hamburgers’ delivered for the East Room event, where chicken nuggets and pizza were also served, after telling reporters that he’d had 300 burgers delivered an hour prior. ‘I had a choice: do we have no food for you, because we have a shutdown, or do we give you some little quick salads that the First Lady will make along with the Second Lady, they’ll make some salads,’ Trump said. Trump paid for the food smorgasbord his White House served to the Clemson Tigers when the national champs visited the White House on Monday evening rather than push the event that the partial government shutdown complicated. ‘We ordered American fast food. Paid for by me. Lots of hamburgers, lots of pizza, I think they’d like it better than anything we could give,’ Trump told reporters as he arrived at the White House after an out-of-state speech.